Following the public presentation by Morir de frio ( Dying of Cold) at ACVic last June, this collective has been included in the programme In Situ to begin a process of joint work, whose main objective is to promote and enhance their current work, which has been displayed on their blog since the beginning of the project. Morir de Frio is a recent project started in January 2012 and promoted by a group of friends, with many things to share. They use the net to the full, passing from the private sphere, where they themselves were practically the only audience for their own debates, to become an open forum for anyone sharing an interest in the various topics they propose. In an interesting and straightforward way, they write about the debates, which are about art in all its contexts. Articles about exhibitions, fairs and festivals reports, video interviews, commentaries on films, or even more philosophical essays may be found on their blog. Sometimes they introduce other young artists from around the world, and sometimes they talk about bikes or fanzines. One of the advantages which they value most of working in the virtual dimension is immediacy: the visitor can be at an exhibition in the morning, and commenting on it in the afternoon. This is why the articles consist of spontaneous writing, far from academicism and formality, to find a direct style, accessible to all kinds of potential readers. The group firmly believe in the power of language to bring art closer to anyone who cares to give it a chance, and to achieve this, the writing should not be an obstacle but rather a means to facilitate the transmission of information among different people. One of the objectives which has emerged from the working process of Morir de Frio is to open up debates and dialogue. If they speak without restriction, and a with a highly critical spirit, it is because they seek contrasts: a question which questions everything they've said, or on the contrary, which reaffirms the ideas discussed in an article. This factor allows them to grow intellectually, and to learn other points of view. Moreover, not only do they look for virtual open debates, but they have also tried to produce them in different live presentations. These have consisted, in their words, of jumping from digital to analog: exiting the virtual dimension to appear physically somewhere, calling upon their readers to find out who is behind this project. 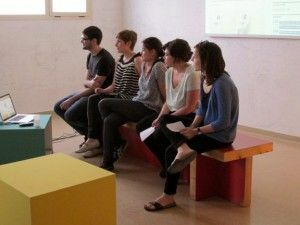 As of September 2012, 2 presentations have been carried out, inviting guests they find interesting, such as Lluis Nacenta in the first presentation, and Victor Sunyol and Joan Ferrer in the second. Both experiences have been very positive and they intend to continue such proposals in the future. Morir de frío is a project by Anna Dot (Vic 1991), Palma Lombardo (Osca 1991), Blai Marginedas (Vic 1990), Raquel Vila (Vic 1990) and Alba Vilamala (Vic 1991).